Hidden within a scrap of woodland on the edge of a Scottish housing estate is one of Europe’s most important artworks. Buried to protect it from vandals, a slab of rock etched with Stone Age carvings is perhaps one the UK’s most neglected prehistoric sites. Yet now, nearly 50 years since it was buried, the 5,000-year-old Cochno Stone is to be re-excavated to allow archaeologists to study it. The stone, which measures 42 feet (13m) by 26 feet (8m), is covered in around 90 grooved spirals and indentations known as cup and rings. The petroglyphs also include a ringed cross and a pair of four toed feet. Researchers are now using cutting edge 3D imaging technology to record the ancient artwork to allow them to study it in more detail. Dr Kenny Brophy, an urban archaeologist at the University of Glasgow who is leading the excavation, said it could help to shed new light on the markings and who made them. He said: ‘This is the biggest and I would argue one of the most important Neolithic art panels in Europe. ‘The cup and ring marks are extensive but the site just happens to be in the middle of an urban housing scheme in Clydebank. ‘It was last fully open to the elements and the public up until 1965. ‘Sadly as it was neglected it was also being damaged through vandalism and people just traipsing all over it. The excavation team will gather high resolution images of the surface of the stone using the same technology used to image Tutankhamun’s tomb, revealing evidence of a new chamber. Once complete the stone will be reburied to keep it safe from harm. Discovered in 1887 by the Reverand James Harvey on a section of farmland near Clydebank in West Dunbartonshire, the Cochno Stone caused a sensation when it was unearthed. It began to suffer vandalism, however, after the local council built the Faifley housing estate on the neighbouring land. Archaeologists feared the ancient rock carvings would be destroyed as people walked over the rock and added their own carvings to it. In 1965 archaeologist Ludovic Maclellan Mann decided to bury it under several feet of soil to protect it from further damage. The new project will aim to use the high resolution images to unpick which of the carvings were caused by vandals before it was buried and which belong to the original. Little is known about what cup and ring symbolise, but they are found in many rock art sites around Europe. Experts are still not sure what the mystery symbols represent. Some experts believe they may have been an ancient form of writing or recording events or perhaps a unit of measure. Others have suggested they may be artworks that symbolise life and death. 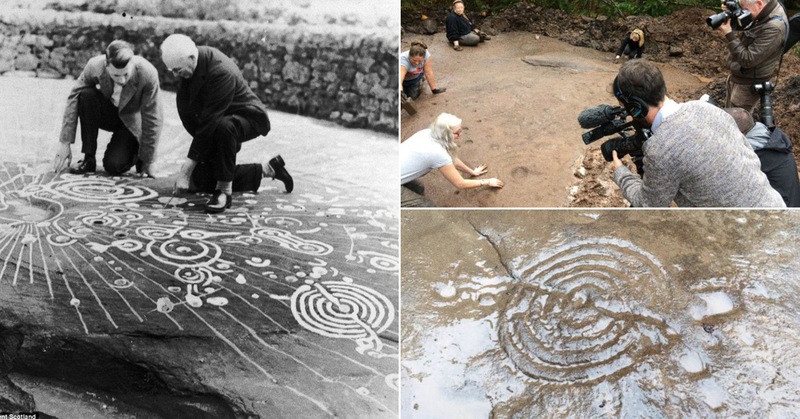 It is possible the Cochno stone was used in ancient Stone Age ceremonies. Ferdinand Saumarez Smith, from the Factum Foundation for Digital Technology in Conservation, which is carrying out the imaging, said the images will also be used to create a replica of the stone slab that will go on display. Cup and ring marks are a form of prehistoric art found widely through out the world. They consist of a round indentation – the cup – surrounded by a series of concentric circles that look like ripples on water. The symbols date back to the Neolithic and early Bronze Age but some examples have been found to date from the Iron Age. Some of the carvings have been found on boulders and outcrops overlooking major routes, hunting grounds or water-holes which has led to suggestions they are perhaps used to mark these spots. Others have suggested they could be a mark of territorial ownership. Later examples have been found in association with burial or ceremonial sites, suggesting they may have a sacred importance.